It’s Your Right To Know! What if you discovered you had a medical condition that resulted in severe migraine headaches every time you ate food that had, for example, MSG (monosodium glutamate) as an ingredient. It wouldn’t matter if a Doctor told you of your reaction to MSG or if you discovered it on your own. If MSG was not required to be included on a label how would you know if you ingested something that you knew would make you suffer needlessly? Many people are not willing to eat food that contains GE (genetically engineered) aka GM/GMO (genetically modified) ingredients like soybeans and corn. Whether you believe GE ingredients are harmful or not or you think it is a political issue, it doesn’t really have any bearing. It is a matter of the right to know what is in your food so you can make a decision based on your own beliefs. There have been two State (California and Washington) propositions on the ballots that were narrowly defeated and two that have passed. The ones that were defeated were the result of large corporations (hiding under the umbrella of the Grocers’ Manufacturers Association – GMA) that spent millions and millions of dollars to defeat these propositions and are now suing those States that have passed GMO labeling into law. Hmmm…why do you think those corporations are spending millions of dollars? Perhaps they stand to lose billions of dollars in profits if GMO’s are required to be labeled. Personally I choose not to eat anything that may be grown with GE seeds or fed food from GE seeds, leaving pretty much organically grown foods and wild caught Alaskan salmon as my foods of choice. GE seeds have been treated with pesticides, mainly Round-Up, to supposedly eliminate the need for weed spraying. Instead, products like Round-Up that contain glyphosate have allowed normal weeds to evolve into “super” weeds that are now resistant to Round-Up, which resulted in an even more powerful Round-Up being maufactured. Round-Up is “billion-dollar-baby” of Monsanto (owned by Pharmacia Corporation), who are the ones who also brought us Agent Orange during the Vietnam War. Many soldiers and civilians were detrimentally affected by Agent Orange and now are under the care of Doctors or even worse, taking or addicted to medications for their conditions. Monsanto has made billions of dollars on Round-Up and they are now trying to corner the “seed” market with some very shady tactics. 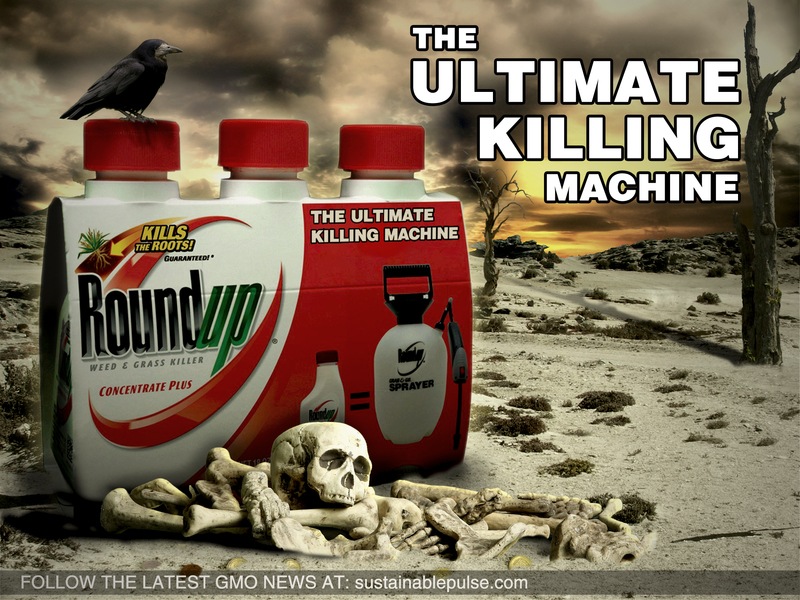 Round-Up has been so successful that other companies, like Bayer, are trying to get their glyphosate pesticides approved (may already be) so they can get in on some of those profits. I won’t go into a lot of detail (follow the links to read more) about our population spraying Round-up on their weeds, followed by that toxic chemical washing down drains polluting our waters, more than likely causing numerous conditions in our children (like asthma, autism, cancer and ADD) who play in the yards sprayed with pesticides. Now we are going to ingest it because, according to Monsanto and the rest of the GMA members, we don’t have the right to know what is in our food. Did I forget to mention all the countries that have banned GE products and require GMO labeling? Click here to see the list. If you are wondering why the United States won’t ban GE products or at least require labeling one only has to look at the list of ex-Monsanto employees who are now enjoying government positions. When I read all the research and studies on GE foods there is no question in my mind that feel so strongly about having the right to know what is in the food I buy! Next ›It’s Only A Label!